Studies have shown that parents play a very important role, in decisions our children make in terms of career choices. 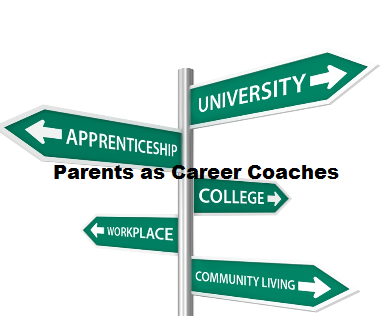 Parents as Career Coaches will provide you with the information, strategies and practical tools to help your child make informed academic, training and career choices. While schools assist students in this area, studies show that parents have the greatest influence on their child’s career journey. This program will ensure you are prepared to assist your child. We hope you will attend the upcoming session, so you can assist your child, throughout their career journey. As parents, we all want our child to be happy and successful in life. One major factor, which will impact this, is their decision around careers. Studies have shown that, the earlier children start to explore themselves and careers, the more prepared they will be. These studies also emphasize the important role parents play, in their child’s career journey.